While around 3 crore women across India have been benefited from PM Modi’s much ambitious Ujjwala Yojana (PMUY), which was spearheaded by Union Minister Dharmendra Pradhan, the goal is to give it a further boost with the help of Pradhan Mantri LPG Panchayat. 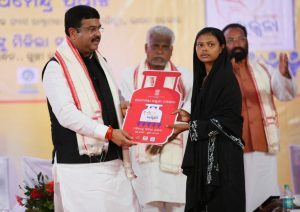 The PM LPG Panchayat was recently launched at a village in Gandhinagar by Dharmendra Pradhan. Critics may say that the initiative was taken to woo the voters ahead of Gujarat assembly polls due in December, but they would admit that the program will definitely bring positive changes. Currently, the average usage of LPG among the 3 crore beneficiaries of Ujjwala Yojana is around 3 cylinders a year, as against seven-and-a-half cylinders of others. The government wants to increase the number by pushing the scheme aggressively in rural areas, where many people still prefer conventional use of cooking fuel. The PM LPG Panchayat would serve as a backup to the Pradhan Mantri Ujjwala Yojana to distribute LPG connections in the rural areas. Around one lakh LPG Panchayats to be held across the country. Officials of the oil PSUs, NGOs, Asha workers and social workers will be part of the Panchayat that aims to connect with the beneficiaries of the Ujjwala Yojana to resolve issues and end confusion if any.